3. To enter, participants must follow the directions on https://www.theexchange.sbs.com.au/ , respond to a questionnaire promoted on https://www.theexchange.sbs.com.au/ answer the survey’s questions and provide their contact details including, but not limited to, full name, email and postal address. 4. The competition period starts on Monday January 1st 2018 at 12.00am and ends on Saturday March 31st 2018 at 11.59pm AEDT (the Promotional Period). Entries will only be accepted during the Promotional Period. 7. Incomprehensible and incomplete entries will be deemed invalid. Entries from participants who are not active members of The Exchange on the draw date will also be deemed invalid. 8. 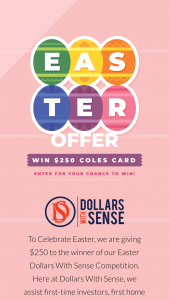 Each valid winner will receive one (1) AUD$50 Coles Myer gift card. The prize will be valued at AUD$50 (RRP) inclusive of GST. There are three (3) prizes to be won. The total prize pool will be valued at AUD$150 (RRP) inclusive of GST. 10. Prizes are not transferable and cannot be exchanged for cash. competition or in connection with taking up the prize. 15. All prize draws will take place at 14 Herbert St Artarmon NSW 2064 on Monday 2nd April 2018 at 9am AEDT. All winners will be notified by phone, email, and/or mail within 3 days of the end of that competition. All winners will be published in The Exchange’s monthly newsletter no later than 30 days of the prize draw following each competition. 17. SBS will conduct such further draws as are necessary in order to distribute any of the prizes. Winners of unclaimed prizes will be notified either by phone or email within 2 days of the unclaimed prize draw. Winners’ names will be published in The Exchange’s monthly newsletter no later 30 days of the redraw of the relevant prize. received at the time of receipt into SBS’s database, and NOT at the time of transmission by the entrant. 28. Authorised under NSW Permit No LTPM/17/02573 Class: Type C; ACT Permit No. TP TP17/02494. Promotions under these terms and conditions will commence on 1/12/2017 and finish on 15/08/2018.